The growing season is here. Yeah! I am ready for home grown veggies and fruit for salad. Unfortunately, all I have harvested so far is carrots, beets and a bit of lettuce. We did buy some peaches (allegedly from east Texas) during our recent trip to Houston. We are trying to eat them all but some needed used in a salad, I thought. And, since the growing season is here, I have previously referenced my need to use up the jam and jelly that I put up last season. I ran across a recipe for “Blackberry Preserve Salad Dressing” in one of my Junior League books (Tables of Content by the Birmingham Junior League to be exact). I adapted this recipe by decreasing the amount of jam, using canola oil, and adding balsamic instead of red wine vinegar. I used a forgotten jar of Blackberry-Thyme jam. 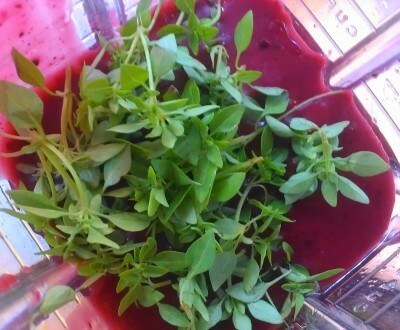 Place all ingredients in a blender and pulse until smooth. Store in refrigerator. Note: If you can’t stand blackberry seeds, you will need to strain this or use a seedless jam. Love these colors. The basil is freshly picked from the herb garden. 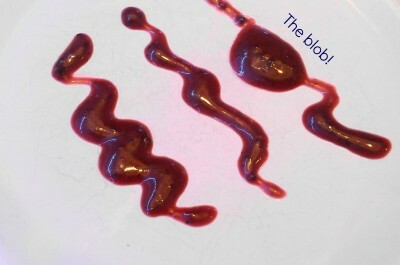 I tried to do some lovely squiggles to show the color of this dressing. Guess a seed got in the way. 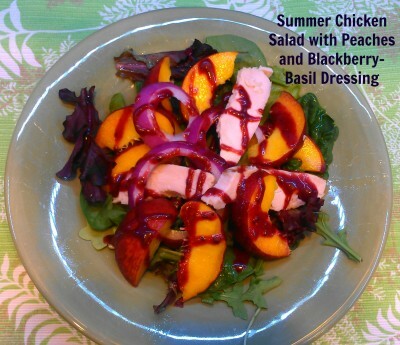 I served this dressing on a spinach-spring mix salad with peaches, red onion, and grilled chicken. I kicked this up a bit by using a peach-marmalade and served this as a sauce on grilled pork chops. It was beyond words. In fact, The Hubs went on and on about how good it was and that it would be great on grilled chicken too. Depending on the thickness of your jam, this dressing might be pretty thick. You can thin it out with a bit of water if desired. Feel free to cut these recipes in half because it does make quite a bit. I am sitting here thinking of all the fruity, jammy, herby concoctions for other dressing and sauce combinations—nectarine and thyme, apple and rosemary, peach and basil…. Side note: What did we do all weekend? 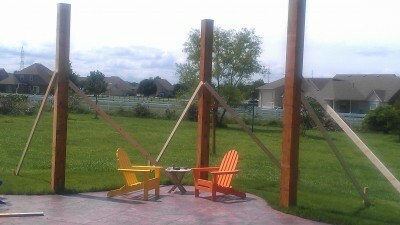 We put up these 10″x10″, twelve foot tall cedar posts for our new pergola. Stay tuned. The blackberry jam with basil is one I will be making come fall. We are just planting our garden here in MI, so we won’t see results for awhile. I can’t wait. The pergola will be nice! Ooooh, a pergola! How fun is that going to be. I can’t wait to see the finished deal. The dressing looks so good. I also end up with jars of jam hidden here and there and this is a perfect way to use it…make the dressing and then use it on salads or as marinades. I’m all over this. Hope you use the idea. That peach is probably my favorite!!! The dressing sounds so yum, Eliot. A very original salad dressing. Thank you very much, Angie. I’m coming for a visit to the pergola! Come now and we will put you to work helping. First, that’s some pretty fancy dressing and since I make both kinds of jam, I will be making both of these! Then I saw your pergola! How great that is going to be! We have 2 Adirondack chairs too – my artist son took ours and made them into Margaritaville chairs just like the ones in the catalog – I love how comfortable they are! We really want to get two more chairs and make at least one more seating area. Can’t wait for it to be done. Wow, such great flavor! Really nice recipe. And it looks like your pergola is going to be a great place to hang out! Thank, John. I can’t wait to hang out under it. May have to have a virtual pergola party. Oh yum, these dressings sound delightful. I’ve done a raspberry vinaigrette with raspberry jam that is amazing so I know these are really good! I just planted my basil today–it has been a cold spring. 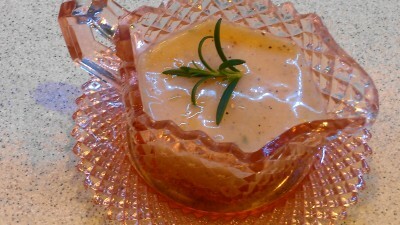 Once I get basil I will be making this lovely dressing. One cannot have too many good dressings! Dressings are vital for salads and I love both your experiments! I deem this one most vital! So good. This is an excellent recipe. Never experimented with blackberries much! Loved your blackberry jam!! Thank you. Blackberries are a local berry that I can get lots of. Picking time should start soon!